Home » india news » Will things ever be the same again for Chhagan Bhujbal? Will things ever be the same again for Chhagan Bhujbal? He was considered to be one of the most powerful leaders in Maharashtra. Once a trusted lieutenant of Shiv Sena supremo Bal Thackeray, Chhagan Bhujbal shifted loyalties and joined the Congress at the behest of Sharad Pawar and followed him to the Nationalist Congress Party. Despite changing camps, Bhujbal was considered to be a mass leader with considerable support from the OBC communities in Maharashtra. Controversies are not new for Bhujbal. In 2010, his name came up in the Telgi fake stamp paper scam. But Pawar firmly stood by him and ensured that Bhujbal sailed through the turmoil. This time, however, alleged corruption in the construction of the new Maharashtra Sadan building in New Delhi has landed him in serious trouble. The NCP seems to have disowned him. The situation has come to a point where Pawar has started promoting party legislator Jitendra Awhad as the new OBC leader. After the Anti Corruption Bureau (ACB) sleuths searched his houses and offices at Mumbai and Nashik on 14 June this year, Bhujbal got a major blow as the Enforcement Directorate (ED) attached property worth Rs 17 crore belonging to Chamankar Enterprises. The promoters of the company are considered to be close aides of the leader and allegedly benefitted from the Maharashtra Sadan contract. BJP leader Kirit Somaiya claimed to have exposed the New Maharashtra Sadan scam through information sought under the Right to Information Act. He had lodged a complaint with ACB against Bhujbal, his nephew Sameer and son Pankaj on 31 July, 2012 for swindling crores through the construction of the New Maharashtra Sadan. Somaiya's colleague and former MLA Devendra Fadnavis is co-complainant in the case. Somaiya alleged that Bhujbal, the then PWD minister of Maharashtra, misused his power and allotted tenders to contractors he favoured and to companies floated by his relatives. The BJP leader also claimed to have submitted documentary evidence to prove his allegations. He said Bhujbal, his family members and close aides floated bogus companies for the scam and also to corner government land at Kalina in Mumbai. Most of the companies were not traceable. They were formed using forged documents, had abnormal valuation and were involved in benami transactions, Somaiya alleged. Many of them have been one-time transaction companies. Some of their bank accounts closed abruptly after a couple of major transactions and the companies were wound up. The promoters created layers to cover up actual beneficiaries and investors. Paperwork remained incomplete or improper. Several documents required to be filed to the registrar of companies were never submitted. Somaiya also complained about evasion of taxes by these complaints. He alleged that as the PWD minister, Bhujbal awarded a contract worth Rs 100 crore to rebuild Maharashtra Sadan to Chamankar Enterprises. Kirit Somaiya also filed a public interest litigation at the Bombay High Court, seeking speedy inquiry into the scam. The court ordered the state government to initiate inquiry against Bhujbal and his family. The HC also asked for a special investigation team to be set up, comprising officials from the ACB and ED to conduct an open inquiry into the mater. The ACB lodged an FIR against Bhujbal and five others after the inquiry in the second week of June this year. The co-accused in the case include former PWD officials such as sub-divisional engineer Gajanan Sawant, the then executive engineer Harish Patil, former superintendent engineer Anilkumar Gaikwad, PWD secretary Sanjay Solanki and MH Shah. Following the investigations, the ED also lodged two cases of money laundering against Bhujbal three months ago. On Wednesday, it attached assets belonging to Chamankar Enterprises. According to ED investigations, the order was given to the company without calling for tenders. 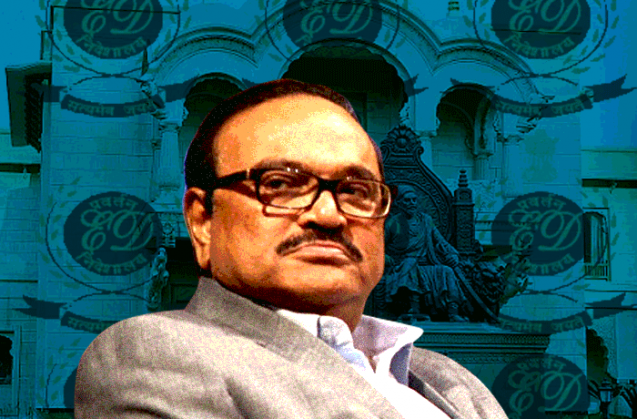 In return, firms and trusts controlled by the Bhujbal family received kickbacks. The ED cited attaching fixed deposits and assets worth Rs 17.35 crore, belonging to Krishna Chamankar, Pranita Chamankar and Prasanna Chamankar, in its report, said a senior official. However, no one has been arrested. The agency registered two Enforcement Case Information Reports under the Prevention of Money Laundering Act against Bhujbal for transactions worth Rs 900 crore. "The first case was about the Maharashtra Sadan Scam and the Kalina land to Chamankar Enterprises. The other is about a real estate development project in Navi Mumbai," the ED official said. Initially, when the ACB registered the FIR, NCP stood firmly behind Bhujbal, alleging political vendetta. Senior leaders such as Sunil Tatkare, Nawab Malik and Bhaskar Jadhav and even party supremo Sharad Pawar rallied behind Bhujbal. But gradually the support started diminishing as more and more evidence emerged against Bhujbal, his son and nephew, exposing their links with the Chamankars. The general perception among political analysts of Maharashtra is that the NCP has abandoned Bhujbal to save Ajit Pawar. He is facing a similar inquiry in an alleged irrigation scam considered to be much bigger than the scams involving the Bhujbals. Milind Ballal, a senior editor and political analyst, feels that the cases against Bhujbal will prove to be game changer in Maharashtra politics. "Bhujbal and his aide Chamankar never anticipated this situation. No political leader in the state had foreseen the change of power at the Centre as well as in Maharashtra," Ballal says. According to Ballal, leaders capable of raising funds for the party become blue-eyed boys of party bosses and get many undue favours. "All those aspiring to be such blue-eyed boys would now hesitate," he says. "Also, between a nephew and a trusted lieutenant, the choice was clear." According to the analyst, there is a lot to be read between the lines. There is a possibility that Pawar - a "friend and guide" to Prime Minister Narendra Modi - has struck a deal to protect his nephew. For Bhujbal, perhaps things will never be the same again. Europe's migrant crisis: why did three year old Aylan Kurdi have to die?